“Creative and imaginative work begins in the solitude of the connection of the mind/eye/hand. This solitary room with a table and a chair is a functional drawing studio,” says architect Steven Holl in the book “House: black swan theory” Princeton Architectural Press, March 2007, accompanying a description of his Round Lake Hut project, which introduces the issues addressed in his conversation with Diana Carta. The book is the result of a meeting between the author, architect and journalist Diana Carta, and architect Steven Holl which took place in May 2016 in the United States, in Steven Holl Architects’ studio on Thirty-first Street in Midtown West New York. The creative process of an artist, or, in this case, a great architect, always offers plenty of material for researchers and intellectuals to study, a topic of interest and discussion that can be approached in many different ways, but the author puts the accent on an unusual aspect. Diana Carta asks architect Steven Holl to concentrate his attention on the place where he works. It is widely acknowledged that many architects and artists choose their studio or atelier with great care. The author mentions numerous examples in her talk with the architect, places that reflect the artist’s work or are intimately connected with it, or that create the best conditions for stimulating creativity and allow the artist to concentrate on the project being worked on. 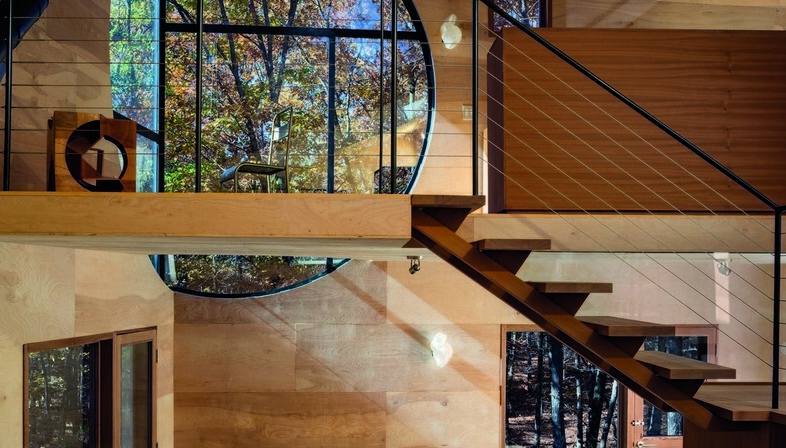 In the case of Steven Holl, the architect has designed a little studio by Round Pond in Dutchess County, in the state of New York. Round Lake Hut, as the studio is called, is a refuge for the spirit, a solitary place measuring only 7.4 sqm with no plumbing or electricity and only the furnishings required for drawing: a table and chair, with windows framing the landscape. A very different working environment from the architect’s studio in the centre of the dynamic city of New York, where the conversation takes place! In actual fact, Round Lake Hut is part of a wider-ranging project involving the entire 11 hectare property owned by Steven Holl and an experimental project by his studio, “Exploration of in”. Beginning with study of the intersection and compression of space, Steven Holl designed a guesthouse and home for artists Ex-of-in-House, described in the last chapter of the book. The small format, numerous photographs and clear, attractive organisation of content make Diana Carta’s book “Lake of the mind - Conversazione con Steven Holl” published by LetteraVentidue a very pleasant book to read, the perfect Christmas gift not only for architects but for fans of the discipline. 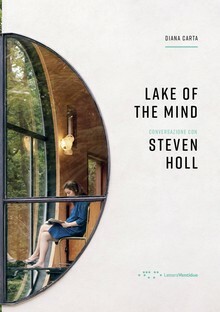 The projects of world-famous architect Steven Holl offer an expedient for exploring the creative process, the tools of the trade and the place where the architect creates his projects. This illuminating read introduces reflections about the circular nature of time, space and how they are perceived today, a question worthy of attention on the part of anyone working in the creative arts.